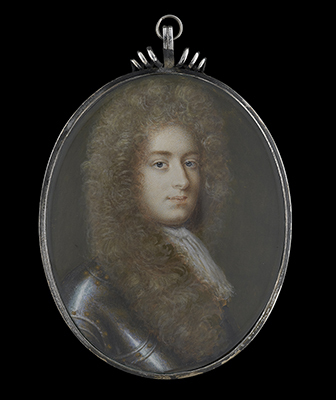 Robert Feilding was one of the most colourful characters of the late Stuart period whose wild, extravagant and dramatic life reads much like a Restoration period drama. Although set for a career in law after being admitted to the Middle Temple in 1673, a large inheritance from his recently deceased father persuaded Feilding to quit and attach himself to the court of Charles II (1630-85), where his famous good-looks and dashing appearance won him great popularity. Feilding married Mary Swift, only child of Barnham Swift, 1st Viscount Carlingford (1606-1634/5) and Lady Mary Crichton (d.1674), whose fortune, according to Jonathan Swift (1667-1745), he supposedly wasted. He soon married again to Margaret Burke (d.1698), daughter of Ulick Burke, Marquess of Clanricarde (1604-58), who had been twice widowed before. Following the accession of King James II (1633-1701) to the throne in 1685, Feilding became a prominent figure in the court of the Catholic king and, after experiencing mild success as a regiment commander, followed the king into exile following the Glorious Revolution in 1688. On his return to England he was imprisoned for his disloyalty, but was later pardoned in June 1697 and soon slipped back into an illustrious life at court. Gambling, women and duelling appear to have been high on Feilding’s agenda at this time - suitable attributes for someone whose carriage was supposedly escorted by footman wearing yellow coats with black feathered hats and sashes. It was probably a result of his decreasing wealth and addiction to gambling which encouraged Feilding to bribe jockeys, a dishonest act for which he would suffer a severe beating from his noble peers. Feilding’s wife died in 1698 and by 1705, in an attempt to replenish his coffers, he turned his attention to the recently widowed former mistress of Charles II - Barbara Palmer, Duchess of Cleveland (1641-1709). Although an eligible match with Feilding’s criteria in mind, his attentions were also drawn towards a reclusive, supposedly wealthy young widow called Anne Deleau, and, after confirming his hunch by studying her late husband’s will, he attempted to make contact with her. After failing to attract her attention following a ‘chance’ visit to her gardens in Kent, Feilding approached her hairdresser and offered her the considerable sum of £500 for her assistance in developing a relationship between the two. In a daring yet brilliant manoeuvre however, the hairdresser instead drafted in the help of a local woman of little wealth named Mary Wadsworth and, remembering that Feilding had never actually met Deleau in person, claimed Wadsworth to be the wealthy widow. The pair were married on 9th November 1705 after having met only once before, and two weeks later the opportunist Feilding also married the Duchess of Cleveland. Six months later Feilding realised he had been duped and after a failed attempt to hide the truth from his other wife, the Duchess of Cleveland found out and requested the marriage to be formally annulled. For the Duchess of Cleveland the encounter with Feilding proved to be a disastrous one: as well fathering a child with her married granddaughter Charlotte Calvert (1679-1721), Feilding also supposedly beat her if she ever refused to give him money to fund his gambling habits. Bigamy was a serious offence during that period, and Feilding only narrowly escaped the death penalty by using the benefit of Clergy loophole, as it was only his first offence. Still faced with the unpleasant punishment of being burnt in the hand, Feilding quickly sought forgiveness from Queen Anne (1665-1714), who subsequently produced a warrant to suspend the sentence. Feilding died on 12 May 1712 and left his property and estates to his accidental wife Mary Wadsworth. This portrait was probably painted in Paris between 1692 and 1696, where the newly Catholic Feilding had joined the court of the exiled king James II. The Swiss-born artist Jacques-Antoine Arlaud, the son of a watchmaker, was already a renowned artist in that city, working for Philippe II, Duc d’Orléans (later regent of France). As one of the pre-eminent portraitists at the exiled Jacobite court, Arlaud was an early ally to the Stuart cause. Feilding probably shared his advocacy, as he was imprisoned on arrival back in England in 1696 at Newgate as a Jacobite.